To gain an accurate view of medieval Judaism, one must look through the eyes of Jews and their contemporaries. 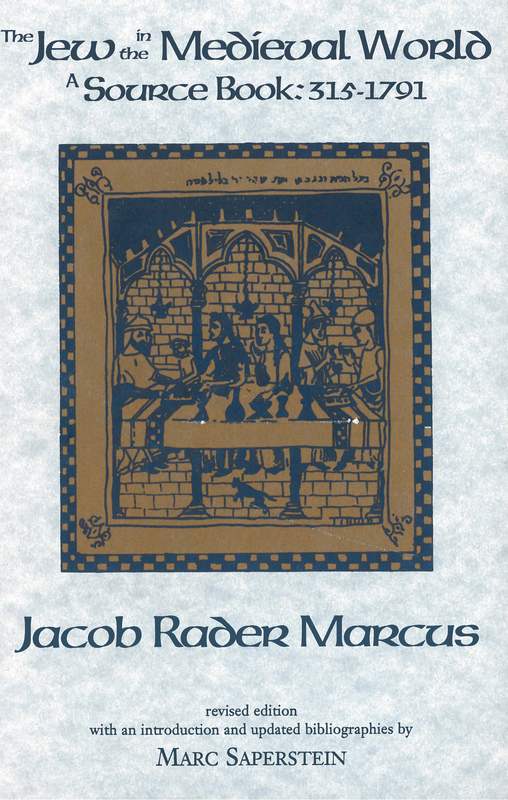 First published in 1938, Jacob Rader Marcus’s classic source book on medieval Judaism provides the documents and historical narratives which let the actors and witnesses of events speak for themselves. The medieval epoch in Jewish history begins around the year 315, when the emperor Constantine began enacting disabling laws against the Jews, rendering them second-class citizens. In the centuries following, Jews enjoyed (or suffered under) legislation, either chosen or forced by the state, which differed from the laws for the Christian and Muslim masses. Most states saw the Jews as simply a tolerated group, even when given favorable privileges. The masses often disliked them. Medieval Jewish history presents a picture wherein large patches are characterized by political and social disabilities. Marcus closes the medieval Jewish age (for Western Jewry) in 1791 with the proclamation of political and civil emancipation in France. The 137 sources included in the anthology include historical narratives, codes, legal opinions, martyrologies, memoirs, polemics, epitaphs, advertisements, folk-tales, ethical and pedagogical writings, book prefaces and colophons, commentaries, and communal statutes. These documents are organized in three sections: The first treats the relation of the State to the Jew and reflects the civil and political status of the Jew in the medieval setting. The second deals with the profound influence exerted by the Catholic and Protestant churches on Jewish life and well-being. The final section presents a study of the Jew “at home,” with four sub-divisions with treat the life of the medieval Jew in its various aspects. Marcus presents the texts themselves, introductions, and lucid notes. Marc Saperstein offers a new introduction and updated bibliography. Jacob Rader Marcus served as Adolph S. Ochs Professor of American Jewish History and Milton and Hattie Kutz Distinguished Service Chair in American Jewish History at HUC-JIR, Cincinnati and founded the American Jewish Archives.